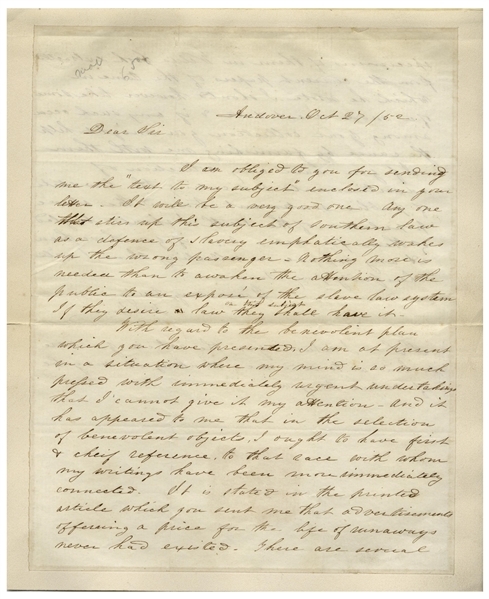 Stowe writes to an unnamed gentleman who had sent her an article. 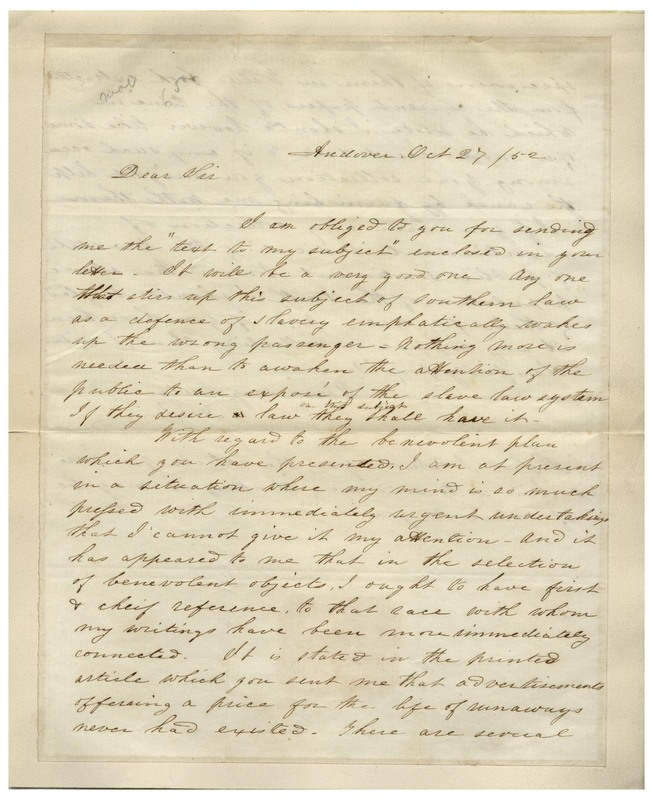 She writes in part, ''...I am obliged to you for sending me the 'text to my subject' enclosed in your letter. It will be a very good one. Any one that stirs up this subject of southern law as a defence of slavery emphatically wakes up the wrong passenger. Nothing more is needed than to awaken the attention of the public to an expose of the slave law system. If they desire law on this subject, they shall have it. With regard to the benevolent plan which you have presented, I am at present in a situation where my mind is so much pressed with immediately urgent undertakings that I cannot give it my attention - and it has appeared to me that in the selection of benevolent objects, I ought to have first & chief reference, to that race with whom my writings have been more immediately connected. 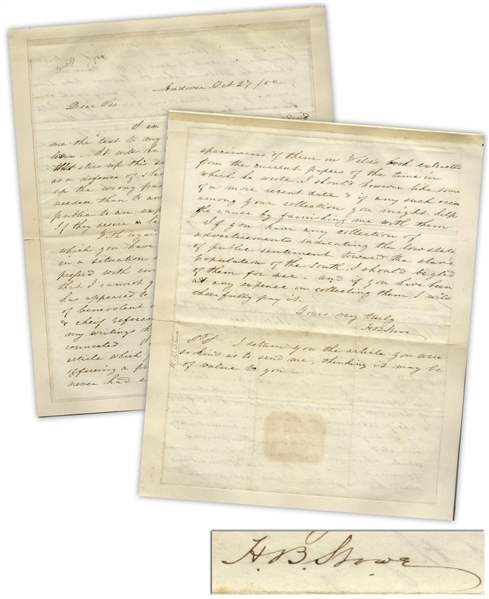 It is stated in the printed article which you sent me that advertisements offering a price for the life of runaways never had existed. There are several specimens of them in [Theodore D.] Weld's book [''American Slavery As It Was In 1839: Testimony of a Thousand Witnesses''] extracted from the current papers of the time in which he wrote. I should however like some of a more recent date & if any such occur among your collection you might help the cause by furnishing me with them. If you have any collection of advertisements indicating the low state of public sentiment toward the slave population of the south, I should be glad of them for use, and if you have been at any expense in collecting them, I will cheerfully pay it. / Yours very truly / H.B. Stowe''. Stowe then adds, ''P.S. I return you the article you were so kind as to send me, thinking it may be of value to you - ''. 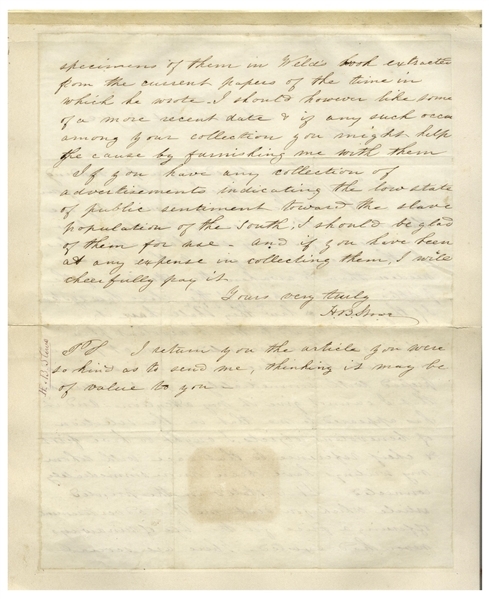 Two page letter on one sheet of wove paper measures 8.75'' x 10.5''. False margin, with remnants from previous mounting to its top edge. Single horizontal fold. Overall very good to near fine condition. Auction closed on Thursday, January 31, 2019.